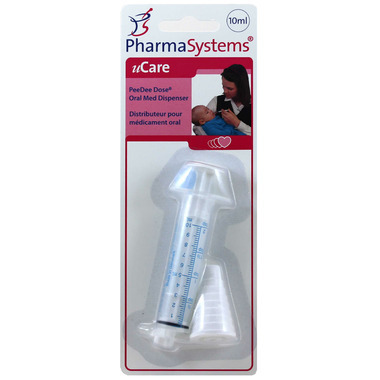 Recommended by pediatricians as the safest, easiest, most effective and accurate way to give medicine to a child. Combination of oral liquid dispenser, tip cap and bottle adapter. This product is the greatest invention ever!! It makes dispensing meds so much easier with no guesswork, or overdosing because of hard to read markings on regular syringes. I just wish there was the option of ordering a couple of extra "funnels" with the PEE DEE ORAL MED DISPENSER. I would highly recommend this product to anyone with small children, or even for adults who have to take liquid medications in small doses.